Family companies in any country can be categorized based on the stage of family and ownership. 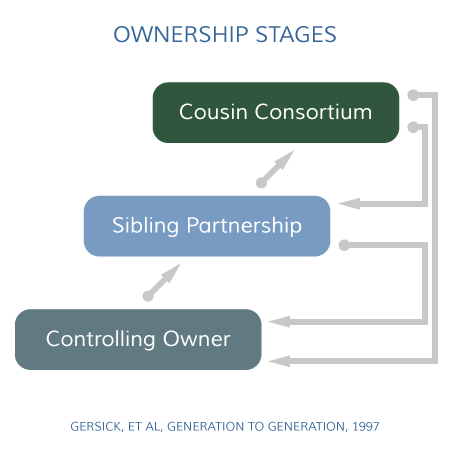 An analysis of family business system development in 1997 led Gersick, et al to create the Three Stages of Development of the Family Business, first published in the book Generation to Generation: Life Cycles of the Family Business. This framework illustrates the typical categories and path that a family company moves along over time. It provides a way to understand the strengths and challenges of family companies at each stage so we can be more prescriptive about how families can prepare for the future. Leaders need to pass the baton not when they are ready to leave, but when their successor is ready to lead.